There are several advantages to installing a spray polyurethane foam roof, also known as SPF roofing. The big advantages are how quick SPF roofing installation is and how inexpensive it often is. 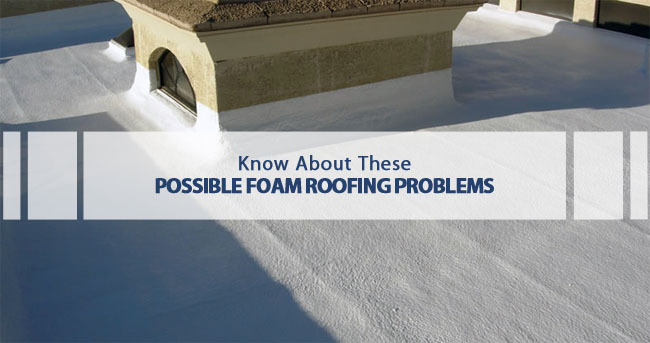 However, there can be some disadvantages to foam roofing that should be considered. Foam roofing is not for everyone, so careful consideration of problems and risks associated with foam roofing is important. When you decide to invest in a foam roof installation, you don’t want to have to worry about foam roof repair immediately after a fresh installation due to poor craftsmanship. Choosing a foam roofing company with great reviews and tons of experience is vital to avoiding complications after a foam roof installation. Proper foam roof maintenance can also further elongate your roof’s lifespan. Still, there can be some disadvantages of foam roofing even if you maintain and properly install your foam roof. Arizona sports many low-slope roofs on commercial and residential buildings. Proper drainage of water, especially when heavy rains blast roofs during the monsoon season, is essential for maintaining the integrity of a roof. If a spray polyurethane foam roof is installed unevenly, pockets will form on the surface that are nicknamed "bird baths". And for good reason. When rain eventually occurs, these reservoirs will collect water and could lead to a very damaged roof. Spray polyurethane foam roofing has a limited window in which it can be applied. This window of time depends on weather conditions including outside temperature and humidity levels. Typically, the best conditions for installing a foam roof is when the climate is warm, very dry, and not windy. Those who live in particularly cold or humid climates could see serious restrictions on the time frame that their foam roof can be installed. 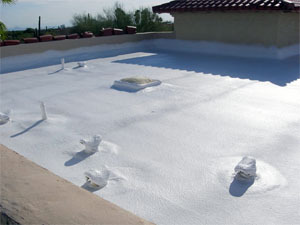 Even in Arizona, if the climate is too sweltering, your foam roof installation could be botched. If spray polyurethane foam roofing is applied outside of the suggested window of time or climate, the integrity of your foam roof can be seriously compromised and blistering in the surface can occur. Spray polyurethane foam roofs have great resistance to heat. However, if a foam roofing company mixed and applied the substance poorly, its insulation capabilities will be greatly reduced. A very specific mixture of chemicals goes into the creation of spray polyurethane foam. If the measurements are even slightly off, the foam roof's ability to insulate heat can be affected. A foam roof's ability to insulate heat, also known as its "R-level", is determined by the thinnest area of application. A foam roof is only as good as its thinnest spot. If a foam roofing contractor in Glendale applies the foam mixture very unevenly, the entire installation could very likely be a giant waste of time and money. It is incredibly important to find a quality foam roofing company, like 1st Class foam Roofing And Coating, to install your foam roof as densely and evenly as possible for maximum insulation. One of the perks of spray polyurethane foam roofs is that they can be installed over existing roofs on a commercial or residential building. However, if all the debri that has collected on the surface of the old roof (gravel, broken chunks of roofing, plant matter, chunks of metal) is not completely cleaned off, the installation of foam roofing could be botched. If spray polyurethane foam cannot properly adhere to a smooth surface, its durability or lifespan will be shortened. Spray polyurethane foam is made of very potent chemicals. Fumes are often waft into the air during foam roof installation. This could be potentially dangerous to people in an around the building during installation. Air conditioning units must be tightly covered and shut down completely during the foam roof installation process. Isocyanate, a main component of spray polyurethane foam, can be very dangerous if breathed in or touched. Businesses will have to be closed during roof installation to avoid these potential dangers. On top of that, spray polyurethane foam can splatter onto nearby trees and buildings with even the slightest breeze. This is why a strictly windless day is required for foam roof installation. Where can I find a great foam roofing company in Arizona? Look no further than 1st Class foam Roofing And Coating, LLC. We are an established form roofing, coatings, and insulation contractor with some of the most qualified roofers in Arizona. The team at 1st Class Foam Roof and Coating will work with you to properly insulate your commercial or residential roof. We take our brand very seriously, and we believe experience is everything when it comes to roofing. Our team, including our owner, estimators, and management includes seasoned roofing veterans of nearly twenty years in the industry. 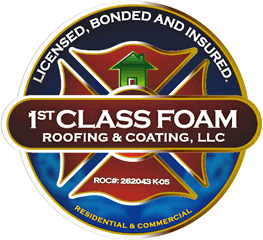 Call 1st Class foam Roofing And Coating, LLC and our representatives will be more than happy to work with you on getting an estimate for quality foam roof repair and foam roof maintenance.